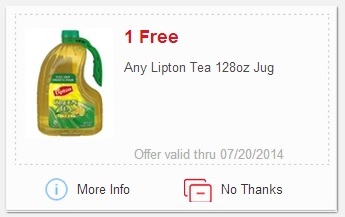 Meijer – *HOT* Possibly a FREE Jug (128 oz) of Lipton Green Tea! p style=”text-align:center;”> Head over to your mperks account and check the snacks & soft drinks tab to see if you have this mperk availableto use. If so you’ll be able to score a large jug of Lipton Green Tea for FREE!!! Note: This mperk is not available to all users.